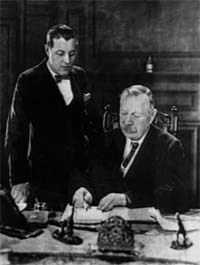 Conan Doyle immediately distanced himself from Dawley's suit, letting his secretary point out the obvious: “If it is true that any one claims that his patents have been infringed in this picture, that is a matter with which Sir Arthur has nothing to do. The actual work of producing the films is in the hands of Mr. Rothacker…” (NY Timess, Jun. 4, 1922). But seeking easy money and noteriety, Dawley intented to file a $10,000 claim for damages against the author. Dawley's lawyer suggested that this was “only a step” towards the eventual legal action to be brought against Rothacker, in which the filmmaker would be milked for $100,000 and an injunction brought against the production and dispossession of The Lost World. Days later, word of any suit had yet to reach the desk of Conan Doyle. As if that weren't enough, Hollywood’s only female producer, Catherine Curtis, wanted her share. 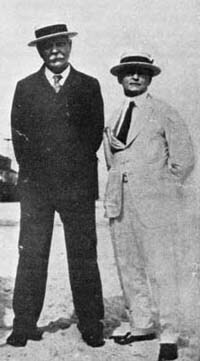 Curtis came forward claiming that Rothacker sold her the rights to The Lost World for $35,000 in July 1920. Noting that she was prepared to invest another $100,000, she said that she had no idea there was a dispute over the rights until she read about Dawley's suit. Unlike Dawley, Curtis was originally content to negotiate a settlement out of court. However, by 1924 both cases had faded into distant memory. When cameras rolled on principle filming, no reporters had bothered to check up on the results. In 1922, Sir Arthur Conan Doyle was on a lecture series in America, trumpeting the cause of Spiritualism that he picked up in the years following WWI and the death of his son, Kingsley. During the course of this tour, Conan Doyle's good friend Harry Houdini invited him to the annual meeting of the Society of American Magicians. But despite being close, their friendship was frequently tested by Houndini's deep-seated skepticism of Spiritualist claims. He and his fellow magicians spoke out a great deal against "psychic" frauds by replicating their phenomenon by stage conjuring. These pictures are not occult… this is psychic because everything that emanates from the human spirit or human brain is psychic. It is not supernatural. Nothing is. It is preternatural in the sense that it isn’t known to our ordinary senses. It is the effect of the joining on the one hand of imagination, and on the other hand of some power of materialization. The imagination, I may say, comes to me. The materializing power comes from elsewhere. Monsters of several million years ago, mostly of the dinosaur species, made love and killed each other in Sir Arthur's pictures. Prehistoric brutes that resembled rhinoceroses magnified many times, equipped with enormous horns that pointed forward like those of the unicorn, drove dinosaurs away from feasts on one another. One monster, like a horned toad of monumental proportions, presented an impenetrable surface of armor plate to attacking reptiles and moved along in safety. Whether these pictures were intended by the famous author and champion of spiritism as a joke on the magicians or as a genuine picture like his photographs of fairies was not revealed. Sir Arthur said they were "psychic" and also that they were "imaginative" and announced in a firm tone, before they were shown, that he would submit to no questions on the subject of their origin. His monsters of the ancient world or of the new world which he has discovered in the ether, were extraordinarily lifelike. If fakes, they were masterpieces. Hitherto, the famous visitor has not been inclined to play with his subject. Sir Arthur is the author of "The Lost World", a novel in which a British scientist discovers in South America a plateau which has survived through geologic time and is still stocked with monsters which raomed the earth millions of years before man developed from the lower forms or was created. The motion pictures were presented without titles or comment of any kind and the audience was left strictly to its own conclusions, whether the sober-faced Englishman was making merry with them or was lifting the veil from mysteries penetrated only by those of his school who know the secret of filming elves and ectoplasm and other things unknown to most minds. My cinema interlude upon the occasion of the magician's dinner should, I think, be explained, now that its purpose was fulfilled. The purpose was simply to provide a little mystification to those who have so often and so successfully mystified others. In presenting my moving dinosaurs I had to walk warily in my speech, so as to preserve the glamor and yet say nothing which I could not justify as literally true. But I was emphatic that it was not occult and only psychic, in so far as all things human come from a man's spirit. It was preturnatural in the sense that it was not nature as we know it. All my other utterances were, as I think you will agree, within the actual facts. The dinosaurs and othetr monsters have been constructed by pure cinema, but of the highest kind, and are being used for "The Lost World" picture which represents pre-historic life upon a South American plateau. Having such material at hand and being allowed by the courtesy of Watterson Rothacker to use it, I could not resist the temptation to surprise your associates and guests. I am sure they will forgive me if for a few short hours I had them guessing. And now, Mr. Chairman, confidence begets confidence and I want to know how you got out of that trunk. Overnight, Conan Doyle made the film adaptation of his novel the most anticipated movie in America!